You do know that every one of these that you eat during the 12 days of Christmas is supposed to bring you a month’s good luck, don’t you? But who needs an excuse: I love mince pies, especially with brandy butter. 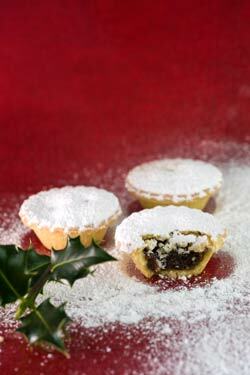 Gluten free mince pies are available online, at many of the suppliers I outlined yesterday, or in the supermarkets. For example, Dietary Specials Trufree mince pies are available in ASDA and Holland and Barratt, as well as online at Goodness Direct; Sainsburys and Tesco have their own brand mince pies; and Marks and Spencer are offering gluten free mince pies too; but I can’t find any gluten free mince pies at Ocado. At Johnson’s Provisions, you can find G-Free and Village Bakery mince pies; Goodness Direct also have the Village Bakery mince pies. You know how I like to find new things: here’s something else new to me – Tarte Maison are doing gluten free mince pies. Don’t forget, if you’re going to offer these to a vegetarian, to avoid suet and lard: use vegetarian mincemeat and butter. And while we’re talking about fats: do be sure that the suet you’re using is gluten free. You can buy gluten free vegetarian suet from Johnson’s Dietary Provisions, from Naturally Good Foods or from Goodness Direct. As an American, I enjoy reading about English holiday customs. We have mincemet pies, but they aren’t served very often, even at the Holidays. Maybe we should to improve our luck. :) I am looking forward to more Christmas posts.